As hard as it is to say goodbye to our weekly Blog of the Week feature, we can’t be sad for long – a brand new feature is taking its place, and its packed full of even more useful content from the blogosphere. 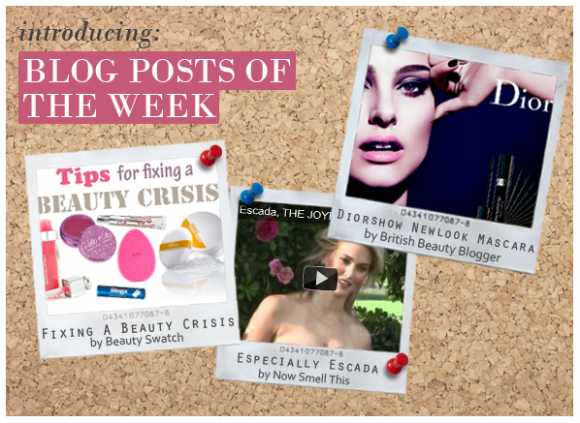 Our inaugural Post of the Week feature starts with some invaluable advice from Beauty Swatch’s Akisa. If you’re prone to flaking foundation, improper contouring or overzealous eyebrow filling, then Akisa’s ‘Tips for Fixing a Beauty Crisis’ has some on-the-go solutions that will sort you right out. With the imminent release of the Diorshow New Look Mascara (31st January – pop it in your diary Dior fans! ), British Beauty Blogger Jane takes a look at the unique features of the innovative formulation, the tapered Nano-Brush, and its special lash catching micro head. Rounding off our posts of the week is news of another upcoming release. Especially Escada is a big launch for the fashion house and is a bit of a departure from the limited edition fruity cocktails that Escada is best known for. This post takes a look behind the scenes of the photo shoot for the scent starring the beautiful Bar Refaeli. This entry was posted on Friday, January 6th, 2012 at 9:16 am and is filed under Blog Posts of the Week. You can follow any responses to this entry through the RSS 2.0 feed. You can skip to the end and leave a response. Pinging is currently not allowed.